Freelance Graphic Designer and Illustrator. Based in Chester, Cheshire Designer offers great value design and branding for local startups, charities and established businesses. As expected, it has taking me a while to complete the first character design from Creating Characters with Personality by Tom Bancroft, but finally, here is Dillon-the hero. The final, colour character design for Dillon. The inked stage of our hero character design, Dillon. Over the weekend I decided to think about what animated films produced over the last 30 years would be in my top 10. I hope this inspires you to watch any that you haven’t seen. 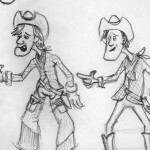 Please let me know if there are any animated films you think should be there. It can be hard to balance learning with creating final products. I concentrate too much on the former, always thinking there is more to understand before my work is good enough to show. 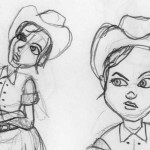 I’m trying to get over this habit and thought I’d share some of the sketches for my final characters based on the exercises in book, Creating Characters with Personality by Tom Bancroft. 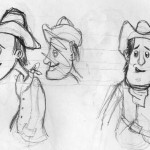 First exercise sketch from the book Creating Characters with Personality by Tom Bancroft. 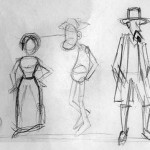 First idea sketches for Polly, Dillons love interest, one of the characters from exercises in Tom Bancrofts book, Creating Characters with Personality. The start of a turnaround sketch of the final Dillon character. 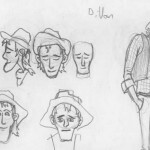 Some ideas for Dillon, hero character from the exercises in Tom Bancrofts book. Hopefully, this will give me incentive to finish them soon for part 2. 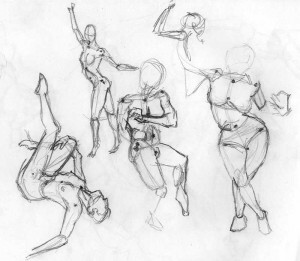 Well, I’ve been spending some time each day improving my figure drawing skills and anatomy knowledge and thought I’d post one of my recent pages from my sketch book. These are 2 minute drawings with the help of the Vilppu Drawing Manual (which is an excellent, interesting book to learn from). My main reason for taking up the pencil again was to help with my 3D work. I love character animation and really would enjoy creating an animated short…I’ve never been happy with any characters I’ve designed though. 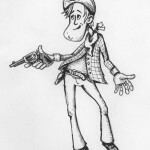 So, my plan started with picking up Creating Characters with Personality by Tom Bancroft. Overall, a very useful book that I’ll review in detail another time. One thing I like is that–as you work through the book–you build your own cast of characters for a fictional animation, so you learn by doing. Shortly after, I was asked to create an illustration of some cartoon Elephant Santas for a charity fun run and, although this wasn’t used, this was my chance to put my new knowledge into practice for the first time! Have you ever felt that you have run out of creative energy and the daily work of a jobbing designer with tight deadlines is just grinding out the same rushed layout over and over…repeat…repeat? I have for a long time, but recently had a couple of requests for illustrations and you know what? I thoroughly enjoyed them! I was reminded of when I was a child and would spend days lost in my drawing with my tongue sticking out (a habit I have when concentrating and in the zone! ), oblivious to the world around me and time passing.